I started my gaming at a very young age. I was blessed enough to have access to a Family Computer (NES in the US) and I was happy enough to watch my dad or uncle play super mario brothers. The game was so so, plumber who hits bricks with his hand and goes down sewer tubes. It wasn't until my dad bought me this little new game called RockMan 2 when I really started to get into games. The gameplay style and the awesome 8bit sprite graphics were the greatest thing that this little boy had laid eyes on. That game came in a box which came with this foldable manual. It was a picture of all enemies and all bosses in the game. Everything was in Japanese, but I didn’t care. I would look at it everyday trying to figure out if there was any clue as to how I could defeat the robot enemies. 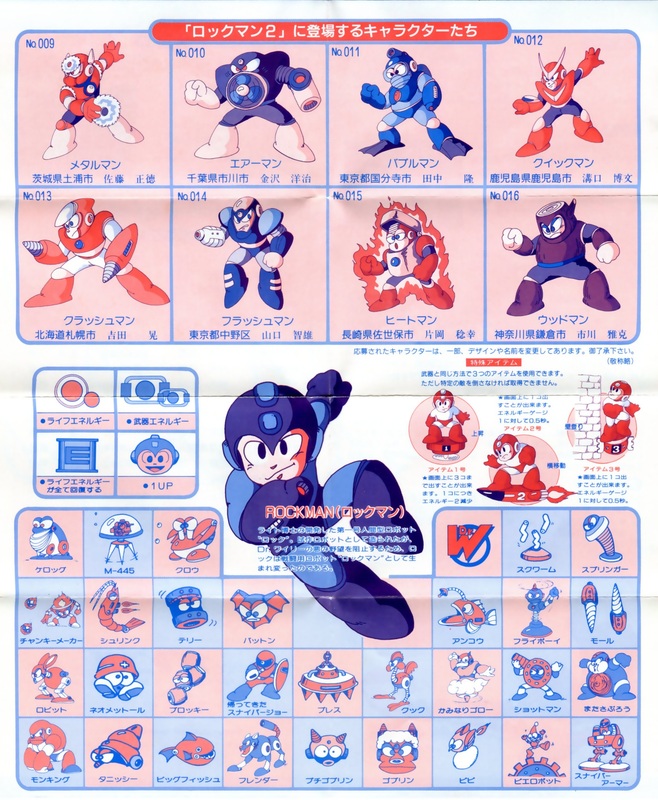 I still have this sheet somewhere in the house, the red cartridge is in a bag in my room together with the Family Computer. Do you have any memorable childhood stuff?